Adham Hafez Company members Salma Abdel Salam, Mona Gamil, Alaa Abdellateef, and Charlene Ibrahim. All photos by Ian Douglas. New York Live Arts hosts the Live Ideas Festival each Spring under a different theme. The festival website is http://newyorklivearts.org/liveideas/. The 2016 theme for the Festival was MENA/Future – Cultural Transformations in the Middle East North Africa Region. 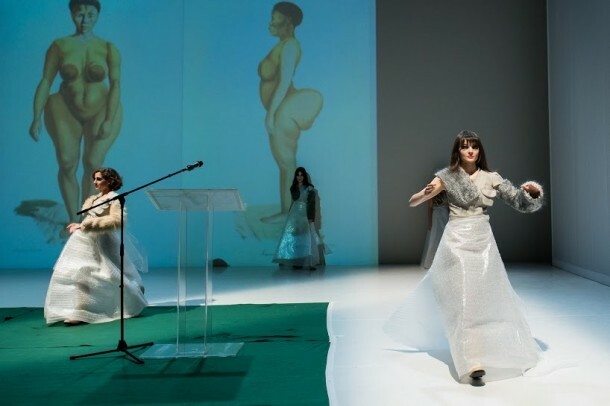 In the program notes, MENA/Future’s co-curator Adham Hafez observed that “contemporary Arab performance is obliged to reside within the limited and limiting spectrum of ‘political art.’” His dance theatre piece 2065 BC was one of MENA/Future’s many performances that explored the potentials and limitations of ‘political art’ in the Middle East and North Africa. Aside from co-curating the festival, Hafez is the Artistic Director of Adham Hafez Company and the Program Director of the Egyptian dance development and research platform, HaRaKa. His work persistently explores the various iterations of political art within tumultuous times and places, such as contemporary Cairo. Conceived, composed, and choreographed by Hafez himself, 2065 BC reimagines the Berlin Conference of 1884, restaging it in a war-torn, dystopian future in which resources are scarce and a new world order needs to be established. The original 1884 conference assembled the world’s major European colonial powers of the time, including Portugal, France, England, and Germany. At the conference, European diplomats sought to strategize the seizure and redistribution of African resources, with particular interest in the extremely fertile Congo River Basin. Fast forward 180 years to 2065 BC, and the fictional and seemingly matriarchal dominion of Arsika holds the power to reallocate the Earth’s resources, which have been seriously depleted after a third World War. As audience members enter the theatre, they are given an Arsikan “passport” (which doubles as the performance program). Immediately visible is Samir Kordy’s simple set for the first act, consisting of a conference table covered in stacks of paper and a single dais with a microphone. Visual Score and Lighting Designer Nurah Farahat’s disorienting collages of women’s faces flicker onto the walls behind the set. Meanwhile, Sound Composer Ahmed Ghazoly’s layered and garbled recordings of feminine voices announces the conference’s commencement. Though things appear slightly foreign in this imagined future, 2065 BC brings up the same questions of occupation, access, and power that undergirded the infamous original conference nearly two centuries ago. Adham Hafez Company members Charlene Ibrahim, Alaa Abdellateef, and Mona Gamil. Stylistically, 2065 BC deconstructs the Berlin Conference into a series of gestural sequences. Performers Mona Gamil, Alaa Abdellateef, Salma Abdel Salam, and Charlene Ibrahim sit astutely at their conference table, shuffling papers until each takes her turn at the dais. When Gamil rises to speak, she counts slowly to 130, confronting the audience with the aggressive monotony of her voice and facial expression. This monotony returns at different intervals throughout 2065 BC, and is at once a frustrating and thought-provoking theatrical choice. Indeed, the tedious vocal formality and measured physicality of the fictional diplomats – who carry themselves almost as if they are cyborg flight attendants – serves as a distancing device. Throughout the conference reenactment, the inability of the audience to halt the monotony calls up Hafez’s core questions around the ethics of occupation. Further alienating the audience are the female diplomats’ costumes (designed elegantly by Nermine Said), which sew together elements of contemporary high fashion, Victorian headwear, and colonial khaki. Although they may challenge the audience, the familiar-yet-strange elements of the acting and design are among the production’s most critical strengths. Indeed, 2065 BC interrogates the notion of political occupation, specifically within the unpredictable political climate of Egypt, North Africa, and the Middle East. Yet it also interrogates the significant ways that women are exploited within these precarious conditions of war and civil unrest. To assert these critical interventions, the conference sequences in Arsika are interspersed with other thematic segments. These sequences include more of Farahat’s stimulating audiovisual projections, an absurdist “Cabaret for the Colonies” scene, and finally a grotesque fashion show displaying the DIY couture of various colonial princesses. Through lyrics, dance, and images, 2065 BC exposes the many ways that wars of power and conquest are fought not only in Africa and Arskika, but upon the bodies of women. 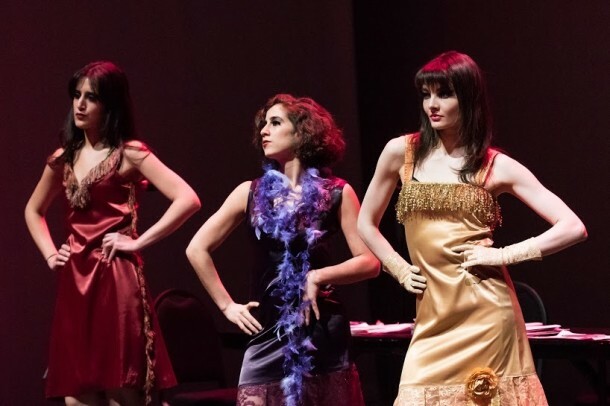 Alaa Abdellateef, Charlene Ibrahim, and Mona Gamil perform in the “Cabaret for the Colonies”. In introducing the “Cabaret for the Colonies,” for example, an announcer lists an absurdly long litany of stripper names that eroticize Middle Eastern and North African culture and conflict, such as “Scarlet O’Sahara” and “Guantanamo Babe.” The cabaret’s MC, aka “Baby Drone,” (played by Salam) guides us through a vaudevillian array of vocal performances by Gamil, Abdellateef, and Ibrahim. These songs juxtapose humor, racism, critical theory, and misogyny, eliciting laughter laced with discomfort. In another sequence, Ibrahim performs an undulating and frenetic belly dance with a pair of large plastic breasts slung across her behind. Her enthralling movements bring to mind Josephine Baker’s banana dance or Saartjie Baartman on display as theVenus Hottentot. Indeed, later in the performance, images of Baartman are projected as a backdrop to the colonial fashion show. The duration of 2065 BC, in fact, is littered with citations to other places, times, and objects. Each citation is entangled within a global politics of occupation and colonization. The hyper-citationality of 2065 BC may stem from Hafez’s time studying under Bruno Latour, the famous French theorist who argued for the critical agency of objects within social networks (known as actor-network theory). Like a Latourian network, Hafez’s concept of political occupation is not married to any genre, place, or time. This epistemological vertigo thereby evokes a kind of ecological ethics, in which everything is connected. Indeed, 2065 BC’s greatest power is that it implicates audiences within the complex global networks of occupation, exploitation, and unrest. Hafez enthusiastically risks alienating his audience with boredom, frustration, and discomfort in order to shed light on our shared responsibility in it all. Chloë Rae Edmonson is a PhD Candidate in Theatre at the City University of New York Graduate Center. Her dissertation investigates the politics of consumption within the intoxicated audiences of immersive theatre and popular entertainments in New York City since the mid-nineteenth-century. She teaches theatre at the City College of New York and holds an M.A. in Performance Studies from New York University and a B.A. in Theatre and English from Trinity University in San Antonio, Texas.